Crime Scene Investigation, Las Vegas started it. 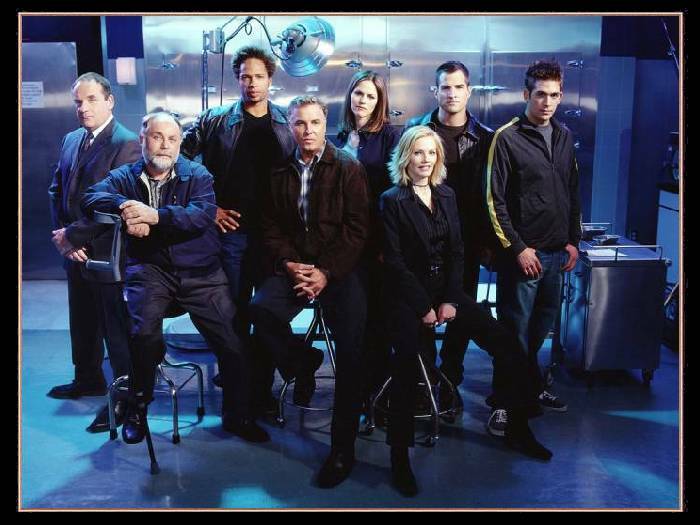 Better known as CSI / LV, this show was so popular that it has spawned a pair of spin-offs. I've enjoyed numerous ensemble programs but this is the first one where I actually formed an attachment to the characters. And not just one or two, I like all of them, I have no favorites here. And I am apparently one of the few fans of this program that liked Riley, I thought she was pretty cool. And I like Ray too ;). Without a Trace is still in my heart though it has gone the way of syndication. And while I liked all of the characters, I do have a favorite here. Jack Malone is the Cat's Pajamas. So is Anthony LaPaglia ;). N.C.I.S. is another favorite, with a confession attached. I like all of the characters - but I started watching this one because of David McCallum. The Man From U.N.C.L.E. is one of two series that I became nearly rabid about (the original Star Trek being the other) before I knew anything about fandom - an odd state of being for an adolescent.. So when Illya Kuryakin showed up on the small screen once more you can bet I was front and center on Tuesday nights :). But I can say that I'd still watch, now, even if Duckie retired, I've gotten attached to the others as well. Cold Case caught my attention for it's premise - the idea of a unit that concentrates on old unsolved cases sounded interesting - turns out it is too :). New technology in use today applied to old cases, where possible, is pretty cool. No favorites here either, I like 'em all! Criminal Minds. Mandy dragged me into this one, and by the time he left the program it was too late for me to leave, everyone was already 'family'. I miss Jason Gideon (and Mandy) but I like Dave Rossi (and Joe). And good glory, Kirsten is a real life woman - she's not only pretty but she can buy her clothes off the rack! Her presence as a main character - who is not a charicature - has gone a long way toward restoring my faith in Hollyweird. Ditto for Dr Reid's presence - Spence is more than the oddball he could have been portrayed as. No favorites here, I like all of them :).